Sept. 16, 2015, 12:14 p.m. I agree with this. And I would even ride nice wheels in the winter if the bike had disc brakes. I've had a few rims destroyed by road salt but this wouldn't be an issue with disc brakes. The only thing holding me back from using a road bike with disc brakes as my winter commuter is that it seems like there are no good fender options. 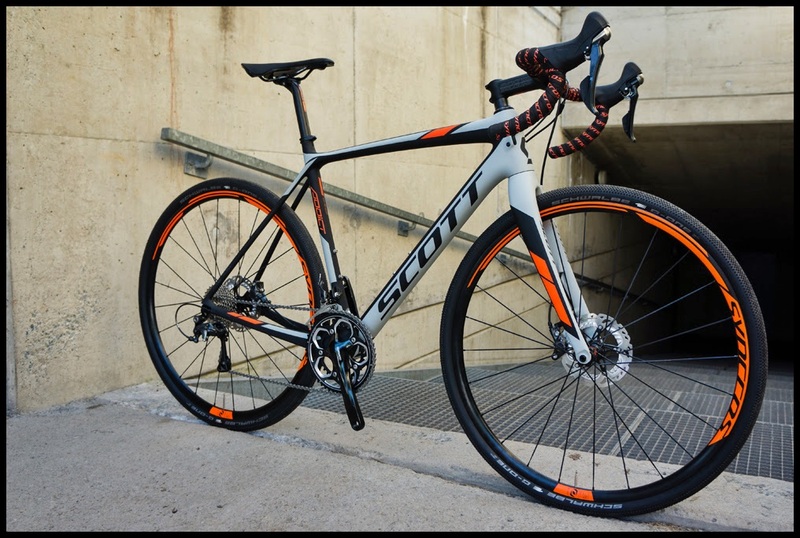 The bikes I've looked at so far (Focus Cayo and Scott Solace) have very narrow clearance in the front fork. The bike shops I visited recommended SKS race blades, but they don't offer full coverage in the front so you still get spray in the face. Sept. 26, 2015, 6:18 p.m. Unless you plan to shave your legs and road race or pull yourself on rides of 10,000 feet total elevation up over mountain passes, my advice is get a CX bike. My fastest ever 40km time trial (Olympic Distance triathlon) was on a cyclocross bike with slicks. Riding skinny tires offroad is a blast. I don't do cx thus a waste of bb height. I'm thinking road bike b/b height touring bike h/a clearance for 38c + fenders gives slightly higher b/b with tyre selection for adventure touring, eh? Sept. 27, 2015, 8:58 a.m. Most new cx bikes don't have a high bb clearance like the old bikes. They reason they had them was so the old school pedal clips wouldn't drag on the ground when the pedals were upside down. Clipless has gotten rid of this requirement, and thus, you'll see modern cx bikes with pretty much the same geo as a road bike. Sept. 27, 2015, 7:59 p.m. Soon to be seen being ridden around Stainley Park with insanely grumpy 50 year old Lawyer/dentist killing it at 25kph. Oct. 4, 2015, 8:45 p.m.
Oct. 4, 2015, 8:47 p.m.
Wft are you? A lawyer who pulls teeth or a dentist who gives legal advice? Oct. 5, 2015, 11:53 a.m. Sounds rad. Have you got a picture of it? There's only a photo of a seat post and a beer coaster for some reason. Oct. 6, 2015, 1:16 p.m.
Cross bikes are usually designed as race bikes though which means short low head tube combined with what can be a higher bb means an aggressive position. Definitely a trend in cross bikes to have lower bb's though. I went with a bigger cross bike to get a higher front end position and shorter stem. Using an 80 mm stem at +6 to get the fit I want. Because I have long arms and legs I can get away with a frame that is in theory too big. With long legs comes a high saddle position and more drop than I can ride with a race style frame. Most riders I see could use this fit. Many riders never ride in the drops because it is too low a position and uncomfortable. I can ride my Giant Defy in the drops for long distances because It isn't too low to be comfortable. My new cross bike has Shimano hydraulic discs. Freaking awesome. It has Ultegra Di2 as well. Not used to it yet but I don't know that it is much nicer than mechanical shifting. I am reserving judgement for now. Oct. 7, 2015, 8:04 p.m.
Wut? Got that from bikerumour.something check Parlee maybe? Nov. 4, 2015, 11:26 a.m.
Nov. 4, 2015, 11:40 a.m.
My new cross bike has Shimano hydraulic discs. Freaking awesome. Mine too! Unbelievable stopping power! Nov. 4, 2015, 12:15 p.m.
Nov. 4, 2015, 6:54 p.m.
Nov. 4, 2015, 7:57 p.m. I enjoy Di2 Ultegra on my Giant. Next skinny tire I'll go with hydraulic disc version. Nov. 4, 2015, 8:51 p.m.
Ah. OK. It looked odd. Their website doesn't indicate any motor driven stuff. But that's not a lock or lock mount I am familiar with. Neat bikes though.